The new Toshiba Libretto W100 looks like an impressive system that will appeal to companies with workers in the field and on the road. It's a handy little device (7.95 x 4.84 x 1.2 inches weighing in at 1.8 pounds) that could easily replace many organizations' proprietary, custom-designed, hand-held systems. And although Android is the new kid on the block for smartphones--and now, apparently, for ultra-mobile PCs (UMPC) as well--there are always compatibility issues and a learning curve to consider. It seems like every time we get proficient in one program or on one system, something bigger and better (or smaller and faster) hits the market, then lands our desk, and once again our efficiency rating takes a nose dive. Don't get me wrong, I am all for newer and better technology, but there are some benefits to the more familiar Windows 7 operating system and its compatible Microsoft Office applications, which run on the Libretto. Android offers a number of free and paid applications, but currently the majority are designed for the smartphone. And although the Libretto has many custom applications as well, it can interact with Microsoft Office apps and even launch Skype video calling. Custom apps include File Browser to access folders and other applications; ReelTime, a visual history of recently opened documents; and Bulletin Board, a sort of visual project and task manager that lets you pin images, notes, reminders, and other widgets to virtual cork boards. That’s where the Libretto W100 wins hands down in the UMPC (or netpad) market. 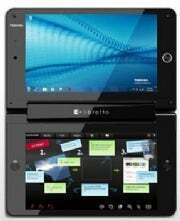 It has two 7-inch diagonal touchscreens (1024 by 600 resolution), which means you can run separate apps on each screen and drag and drop information, icons, and images back and forth between the dual screens. You can use this system as tablet or a notebook, which means you can draw or take notes as well. Hardware includes an Intel 1.2 GHz processor, 2GB of DDR3 RAM, and a 62GB hard drive. The keyboard is virtual, which you can configure for a full 108 QWERTY layout, simplified QWERTY (minus the numbers/symbols on top), a 10-key numeric pad, Dial Keys-style split board for thumbs-only use, plus two other options. Other hardware includes a one-megapixel Webcam with face recognition and an eight-cell battery that lasts four to five hours, according to Toshiba. Ports, slots, and communication features include a microSD card slot, one USB 2.0 port, 802.11 Wi-Fi, Bluetooth 2.1+EDR, and optional mobile broadband. If you're using Windows, this little gadget seems to have it all. Its seamless synchronization is another big plus for users such as sales staff, field technicians, and other offsite workers that must integrate all their data into a larger system on a network or onto a company server. The Libretto is comparable to Apple’s iPad--which does not have a Web cam, a USB port or a microSD card slot (unless parked in its docking station, which costs extra). The iPad also lacks compatibility with the Flash Media Player, which means Web surfers cannot access or view the millions of sites using Flash. Toshiba has not yet confirmed a list price, but other reports have suggested it will initially cost between $1000 and $1400. That’s a bit steep in comparison to the iPad, which retails between $500 and $850. But for a Windows-dedicated office, it’s definitely a better choice. Unfortunately, Toshiba hasn't set a release date for the W100, which some industry observers expect late this summer.